The USS Arizona burning after Japanese torpedo bombers attacked the battleship on Dec. 7, 1941. Japan’s attack at Pearl Harbor, Hawaii, killed 2,402 people and wounded another 1,247, plunging the US into a war that ultimately cost America and its allies more than 61 million military and civilian lives. Axis countries lost more than 12 million lives. My father used to tell me about from coming home from church in San Francisco that Sunday, Dec. 7, when a neighbor shouted out the window to him that the Japanese had just attacked Pearl Harbor. Friday was the 71st anniversary of the attack, and heavily attended memorial ceremonies were held from Pearl Harbor, to the Coast Guard Station in Alameda, to New York and Washington, DC. The annual Christmas-tree lighting in Point Reyes Station drew a large crowd Friday evening. The tree is on the landscaped median between the Palace Market parking lot and the parking lot of Wells Fargo Bank, which handed out hot chocolate and sweets. Meanwhile at the Dance Palace community center, Marin Agricultural Land Trust held its annual dinner Friday. Now an octogenarian, Phyllis Faber, a biologist, and the late Ellen Straus, a rancher, founded MALT in 1984 to give permanent protection to family farms. It was a time when economic pressure to subdivide the coast was spurring ranchers to sell their land to developers. The farmland trust became the first of its kind in the nation. A red-shouldered hawk is still able to hunt the pastures around Mitchell cabin thanks to a century and a half of ranching, which served to protect much of West Marin from over-development. Bob Berner, who has been MALT’s executive director since its founding 28 years ago, will retire next month, and Friday he gave an emotional farewell to MALT supporters in the Dance Palace. Under Berner’s leadership, MALT has bought agricultural easements from 69 ranchers, guaranteeing that at least half of all Marin County’s family farms will forever remain in agriculture. A herd of blacktail deer take advantage of West Marin’s open land to graze near Mitchell cabin. MALT’s new executive director as of Jan. 14 will be Jamison Watts, who happens to be a great, great grandson of naturalist John Muir’s sister, Margaret Muir Reid. Watts for the past six years has been the executive director of the Northern California Regional Land Trust (NCRLT). Watts, who inherited the Muir family’s interest in conservation, earned a degree from UC Davis in Environmental Biology with an emphasis in Conservation Biology. He spent the next 12 years as a field and wildlife biologist, while simultaneously earning a master’s degree in Biological Sciences, before going to work for NCRLT in 2006. Much of the Rich Readimix plant was under water when Papermill Creek overflowed its banks on New Year’s Eve 2005. 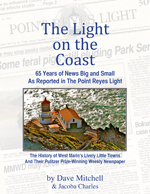 In sadder news this week, The West Marin Citizen reported that the Rich Readimix plant on the Point Reyes-Petaluma Road is about to close after more than 60 years in operation. Don and Doug Joslin created the cement plant during the 1950s, and it was so well known throughout West Marin that nearby Platform Bridge was commonly referred to as Joslin Bridge. After 35 years, the Joslins sold the plant to Rich Readimix, which also has a plant in Greenbrae. All the workers at the West Marin plant will now be transferred to Greenbrae. Sparsely Sage and Timely is powered by	WordPress 4.9.10 and delivered to you in 0.574 seconds using 54 queries.